Indictment filed for incitement, praise for murderers, calls to harm Jews; fails to appear at today's hearing on her case. 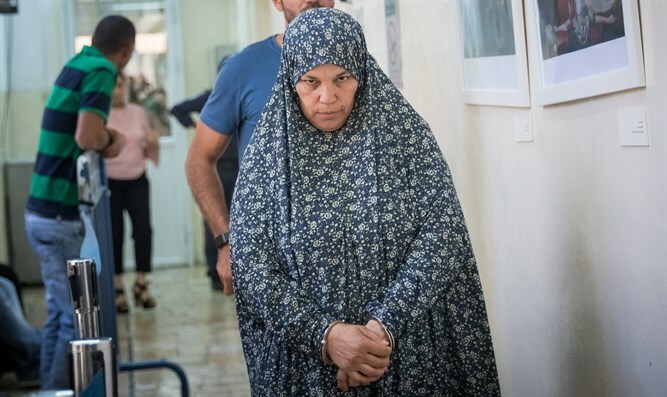 The mother of the terrorist who carried out the attack at the Damascus Gate in which border policeman Hadas Malka was murdered absented herself today (Tuesday) from the hearing on her case. An indictment was filed against her for incitement, praising murderers, and issuing calls to attack Jews. Attorney Chaim Bleicher of the Honenu legal aid organization who assists the family as victims of a terror offense, arrived today for the hearing in Ofer Military Court. Bleicher said what was occurring was a methodical court hearing evasion. He reports that it is a prevalent phenomenon in which Arabs who are accused of nationalist crimes absent themselves from court hearings without explanation or prior notice. In response to the mother's behavior, Bleicher demanded that the prosecution execute the guarantees she signed when being released from detention and demand that the mother forfeit her bond. The hearing on her matter was postponed and a new date for the hearing was set.